Reference number for this case: 17-oct-54-Andigné. Thank you for including this reference number in any correspondence with me regarding this case. A newspaper reported that two days ago on Sunday, October 17, 1954, at an unspecified time, Albert Géraud, aged 15, farm worker in Montguillon, was riding his bicycle on the road from Andigné to Saint-Martin-du-Bois, in the Maine-et-Loire department, when he saw a light which changed from green to yellow. The light descended jerkily and reached the road. Seized by panic, the young man felt his legs were paralyzed. Having reached the ground, the light revealed itself to be a "transparent saucer releasing a red gleam." In the inside of the saucer, was a small being of 1 m 20 height, covered with hair from the head to the feet, and with large eyes, which looked at the witness. The object rose suddenly, causing a violent blow of air in the back of the witness, and it went away in the direction to Lion d'Angers. The witness was very frightened and remained in prostration during several days. It was in 2014 that author Julien Gonzalez published new information on the case. It was not on the 18th or 20th like some ufologists had written, but on the 17th, a Sunday, as told in the newspaper Le Courrier de l'Ouest dor October 21, 1954, the apparent primary source. Gonzalez said the witness was from in Vault-sur-Oudon, and was before Maison-Neuve when he saw in the sky a disc which passed from the green to the yellow color while going down by jerks towards the ground. In the Peess, he had told: "The disc was transparent, inside there was a man of small size (1,20 meter according to the second source) seated motionless. His eyes were large like eyes of pigeons and it was covered with hairs, but I do not know if it were not a coat. It stared at me and I was terrified. That lasted at least five minutes. Then the light turned off and the disc flew away. I felt a gush of air on my back." Thrown into a panic, he fled to the Malaboeuf family, farmers at Maison-Neuve, where it took a few moments before he was able to tell about his adventure. He asked his boss to leave rather early to return before the night for he was afraid to see the small hairy man in his "saucer" again. Gonzalez adds that in 1989, investigators of Lumières Dans La Nuit met Albert Gérault at his home. He claimed to be the father of the witness who himself would have died seven years ago, and the conversation was almost impossible as Mr. Gérault repeated that he is not interested. 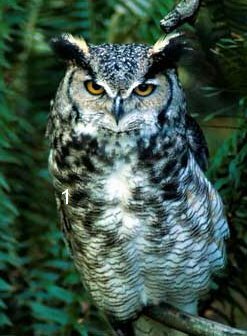 The two authors indicate that between Andigné and Saint-Martin-du-Bois, on October 20, 1954, a young farm worker had a strange encounter with a 1.20 meters visitor covered with hairs from the head to toe and with eyes of owl. They add that "even when it is a bet with buddies, the 'alien mimicry' draws its resources in the feathery fauna of our planet" in Andigné like in Loctudy where the being had eyes like pigeon's eggs. The two authors indicate that on October 18, 1954, at an unspecified time, Albert Géraud, aged 15, farm worker in Montguillon, was riding his bicycle on the road from Andigné to Saint-Martin-du-Bois, in the Maine-et-Loire department, when he saw a light which changed from green to yellow. Suddenly the object rose, causing a violent blow of air in the back of the witness, and it went away in the direction to Lion d'Angers. The authors indicate that the source is Ouest-France for October 20, 1954, page 1, anf that there was no investigation as far as they know. It was a bet. B.B. p. 77. 20. Andigné - St-Martin-du-Bois (Maine et Loire), October 20th, 1954. B&B Version: bet... (p.77) LDLN version: We met Albert Gerault at his home. He claimed to be the father of the witness who himself would have died since seven years. The conversation was almost impossible. Mr. Gerault says several times: "It does not interest me." his attitude seems to us to be thather that of a witness who wishes to forget than that of a merry prankster. The author indicates that on October 18, 1954 at an unknown hour, in Andigne/Saint Martin du Bois, in the Maine-et-Loire, Albert Gérault, aged 15 at the time, rode by bicycle on the D216 and suddenly noticed a light passing from the green to the yellow, which came down by jerks and reached the road. Very frightened, he felt paralyzed in the legs. An object landed, there was a small hairy being inside, hairy from head to feet, with eyes like those of an owl. The object took off suddenly causing a violent wind that the teenager felt in his back, and it disappeared in the direction of the Lion of Angers. The young man remained prostrate several days. The author indicates that Barthel and Brucker had explained the incident as being the result of a "bet" thus a joke, but he rejects this explanation by arguing that they faked their investigations and thus no credit is to be given to this one; and that moreover the same evening a schoolboy in the Ille-and-Vilaine lived a similar experience. 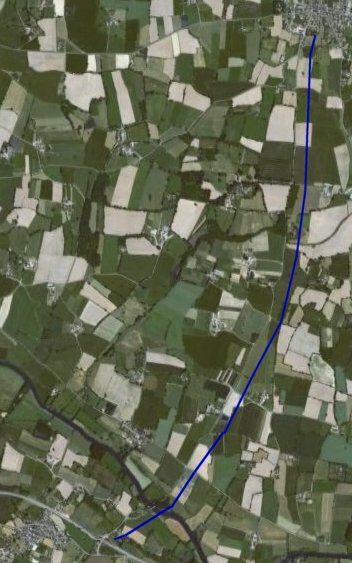 The Belgian ufologist indicates that in 1954, on October 18, in France, in Andigné/St Martin du Bois "Albert Géraud, aged 15, circulates by bicycle on the D216 and sees a light which passes from the green to the yellow. It goes down by jerks and reaches the road. Seized by panic the witness feels his legs paralyzed. The saucer is on the ground, a small being covered with hairs of the head to the feet is inside and looks at Albert: its eyes are large. Suddenly the object rises, causes a violent wind in the direction of the witness and disappears in the direction of the Lion of Angers. Prostrate witness during several days." The source is indicated as "FIGUET/ J.L. RUCHON: 'Ovni, premier dossier complet...' - Alain Lefeuvre pub. 1979, p. 182, 183". 15-year old Albert Geraud was on his bicycle on route D216 when he sees a light that turns from green to yellow. It descends in a jerky motion and lands on the road. The panicked witness feels likes his legs are paralyzed. Inside the object he could see a small being covered with hair that stares at the witness with large eyes. Abruptly the object rises, emitting a strong gush of wind in the direction of the witness and disappears in the direction of Lyon. After the incident the witness lies prostrate in bed for several days. Luc Chastan indicates that in the Maine and Loire in Andigné on October 18, 1954, "a young man circulates by bicycle on the road of Andigné in Saint-Martin-du-Bois. He sees a light which passes from the green to the yellow. This gleam descends by jerks and reaches the road. Seized by panic, the witness feels his legs paralyzed. The object is on the ground it is a transparent 'saucer' releasing a red gleam. Inside, there is a small being 1 m 20 tall covered with hairs from head to toes who looks at the witness, its eyes are large. Suddenly, the object rises, causes a violent wind in the back of the witness and disappears in direction of the Lion of Angers. The witness, frightened, remained prostrate during several days. The website indicates that on 18 October 1954 on D216, south of St Martin-Du-Bois, France, "Disc lands on road. Hairy dwarf with owl eyes inside. Takes off, flies rapidly to the SSE." "An object was observed. Occupants of the craft were seen. One disc was observed on a highway for two minutes. One hairy dwarf was seen." Farm worker Albert Gerault (15) was cycling between Andigne and St Martin-du-Bois when he caught sight of a light changing from green to yellow that descended to the road in a jerking motion. The boy was panic stricken and his legs were paralysed. The object was transparent and when on the ground emitted a red light. Inside Albert could see a small man, 1.2m tall, covered in hair from head to toe, and with large owl like eyes that seemed to transfix the boy. The object then took off over his head and disappeared in the direction of Le Lion d’Angers. Albert felt a violent blow on his back. Alain Gamard citing Ouest France 21 October 1954. *Oct. 18, 1954 - Sometime before midnight 15-year-old Albert Geraud was on his bicycle on route D216 between Andigne and Saint-Martin du Bois, Maine-et-Loire, France when he saw a light that turned from green to red. It descended in a jerky motion and landed on the road, revealing a saucer-shaped object giving off a red gleam on the ground. The panicked witness felt like his legs were paralyzed. Inside the object he could see a small being covered with hair, that stared at him with large eyes. Abruptly the object lifted off, emitting a strong gush of wind toward the teenager, and it zipped away in the direction of Lyon. After the incident the witness had to lie prostrate in bed for several days. (Source: Michel Figuet & Jean-Louis Ruchon, OVNI: Le Premier Dossier Complet des Rencontres Rapprochees en France, pp. 182-183, citing Ouest France, October 20, 1954; Albert S. Rosales, Humanoid Contact Database 1954, case # 2435, citing Figuet & Ruchon). The witness was Albert Gérault, 15 years old, farm employee in Montguillon. Living in Vault-sur-Oudon, but working in Montguillon, he was riding his bicycle on the road from St-Martin-du-Bois to Andigné when before Maison-Neuve he saw in the sky a disc which passed from the green to the yellow color while going down by jerks towards the ground. He was terrified and said: "The disc was transparent, inside there was a man of small size (1,20 meter according to the second source) seated motionless. His eyes were large like eyes of pigeons and it was covered with hairs, but I do not know if it were not a coat. It stared at me and I was terrified. That lasted at least five minutes. Then the light turned off and the disc flew away. I felt a gush of air on my back." Thrown into a panic, the young Albert Gérault fled to the Malaboeuf family, farmers at Maison-Neuve, where it took a few moments before he was able to tell about his adventure. Julien Gonzalez notes that the case was often dated from October 18 by the ufologists (M. Figuet, J. Sider), but the Courier de l'Ouest for October 21, 1954, clearly specifies that it was on "Sunday evening" thus on October 17. He adds that in "La Grance Peur Martienne", Misters Barthel and Brucker affirm that the case is a hoax, but in 1989, investigators of Lumières Dans LA Nuit met Albert Gérault at his home. He claimed to be the father of the witness who himself would have died seven years ago. The conversation was almost impossible, Mr. Gérault saying on several occasions: "This does not interest me", an attitude which we [?] found more to be that of a witness who wishes to forget that the attitude of a merry prankster. The sources are said to be Le Courrier de l'Ouest for October 21, 1954; Ouest France for October 20, 1954; Michel Figuet and Jean-Louis Ruchon, OVNI: le premier dossier complet des rencontres rapprochées en France, pages 182-183; Jean Sider, Le dossier 1954 et l'imposture rationaliste, page 208. A farm boy Albert Giraud (15) was riding his bike from Andigne to Saint Martin du Bois when he saw a light changing from green to yellow descending jerkily towards the road. The lad felt paralysed by fear. On the ground the thing resembled a transparent saucer giving off a red light, inside of which was a being 1.2m tall, covered with hair from head to feet and with large eyes. The object took off giving off a blast of air which hit Albert in the back. The boy was so terrified that he was bedridden for several days. Evaluation - Very distorted account of an owl ? Note: The source reference "Gross URECAT" is my file as it appears in my CE3 catalogue URECAT; the file content is the same as this page of my France 1954 catalogue. rogseron provided no lin, and its content is not really reflected. Here is again a case of the 1954 French saucers flap that the duet of self-proclaimed "rationalists" Barthel and Brucker seem to have treated oddly, in an almost laughable manner. Let's note that, significantly, they were mistaken in the date, giving that of the publication of the newspaper reporting the encounter instead of the date of the encounter - the sort of error they used to blame on ufologists. But even more interesting: whereas, ironically, they are the only to mention that the entity had the eyes of an owl, which is the probable key of the case, instead of deducing that it was perhaps a confusion in which a young 15-year-old farm hand, perhaps impressionable or little educated, had mistaken an owl for a creature of space, in the night, they ensure us without any other sort of information that it was "a bet between buddies." But bet about what? A bet what the young man would make a confusion in the evening? Prophecy, then, undoubtedly. A bet that one of the "buddies" disguised in owl would be called a Martian by the victim buddy? Does this hold any water? I don't think so. Knowing how often these two authors sometimes purely and simply invented explanations suiting their needs, which in other cases was proven, contrary to Michel Figuet who became a "skeptic" except when it came to the "investigations" by Barthel and Brucker, I do not believe one second that this encounter had anything to do with a "bet between buddies", and I much rather suspect that the testimony is sincere, and that only the interpretation of the entity could be erroneous, an owl sometimes looking quite impressive, especially by night and especially if the witness had just seen or believed to see one of these much-spoken flying saucers that filled the newspaper at the time in France. An owl passed by in the night at an unspecified distance by a teenage might well appear to him as being a rather small creature, covered of "hair" - i.e. feathers - with eyes like those of an owl. This being said, I also see that this explanation can be put forth only if the account given by Figuet apparently based on the journalistic source was very distorted by the journalistic source: it is indeed specified that the creature was inside the saucer. Perhaps was this saucer, said to be "transparent", only some gleam of some car's headlights? But headlights that change color? Who knows? Not me, therefore I cannot really conclude. Region of anger, the terrain heights. 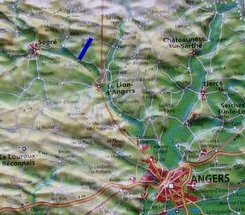 The blue line indicates the road segment between Saint-Martin-du-Bois above and Andigné below, a 6 kilometers segment where the sighting is said to have taken place. 2007 satellite picture of the area between Saint-Martin-du-Bois and Andigné. The blue line is next to the road segment. So: probable bet or joke or owl. [---] Article in the regional newspaper Ouest-France, Bordeaux, France, page 1, October 20, 1954. [---] Article in the regional newspaper Le Courrier de l'Ouest, France, October 21, 1954. [bb1] "La Grande Peur Martienne", book by Gérard Barthel and Jacques Brucker, Nouvelles Editions Rationalistes publishers, France, page 77, 1979. [fr1] "OVNI, Premier Dossier Complet des Rencontres Rapprochées En France", book by Michel Figuet and Jean-Louis Ruchon, Alain Lefeuvre publisher, France, pp 182-183, 1979. [ld1] "Geographical coordinates according to different plotters French UFO landings September 26, 1954 - October 18", liste dans le magazine d'ufologie Lumières Dans La Nuit (LDLN), France, N° 209, page 18, novembre 1981. [mf3] "ATTERRISSAGES D'UFO sur le continent français du 26 septembre 1954 au 18 octobre 1954", list by Michel Figuet in the ufology magazine Lumières Dans La Nuit (LDLN), France, #249-250, page 27, March / April 1985. [mf2] "Catalogue Francat des rencontres rapprochées en France (Listing 800 1982) (2 - Suite)", list compiled by Michel Figuet, in the ufology magazine Lumières Dans La Nuit (LDLN), France, #257-258, page 19, November / December 1985. [ld2] "La Grande Peur Martienne - Canular après enquête! ", article par le "Groupe d'Enquête sur 1954 de Lumières Dans La Nuit", dans le magazine d'ufologie Lumières Dans La Nuit (LDLN), France, N° 299, page 34, septembre - octobre 1989. [js1] "Le Dossier 1954 et l'Imposture Rationaliste", book by Jean Sider, Ramuel publisher, France, pages 208,259, 1997. [jg1] "RR3 - Le Dossier des Rencontres du Troisième Type en France", book by Julien Gonzalez, Le Temps Présent publishers, France, pp 144-145, 2014. 0.1 Patrick Gross July 11, 2007 First published. 1.0 Patrick Gross June 6, 2009 Conversion from HTML to XHTML Strict. First formal version. Additions [js1], [go1], [lc1], [ud1]. 1.3 Patrick Gross November 15. 2014 Addition [ni1]. 1.4 Patrick Gross October 29, 2016 Addition [jg1]. Change of date day, 17 not 18. Addition of the Summary. 1.5 Patrick Gross January 14, 2019 Additions [mf2], [lh1], [pr2]. 1.6 Patrick Gross March 30, 2019 Additions [ld1], [mf3], [mf2], [ld2]. This page was last updated on March 30, 2019.